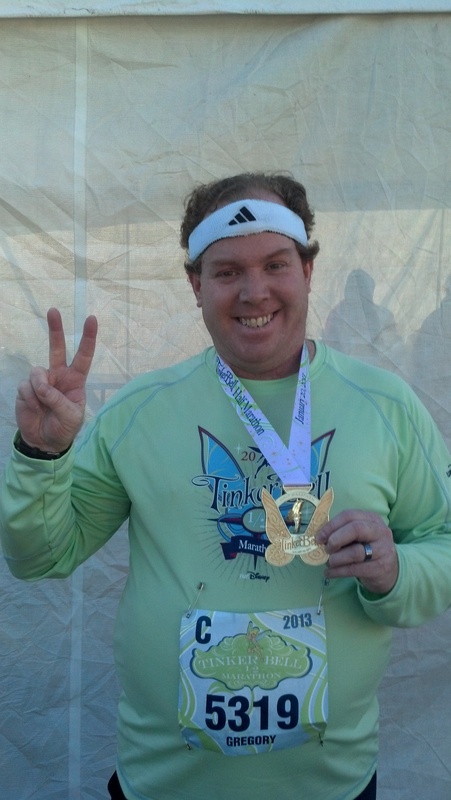 January 20, 2013 is a day that I will long remember as the day I caught the running bug. It was also the day that I finished my first (and thus far only) half marathon. After running in the Neverland 5K with my wife the previous morning, we spent the rest of the day at Disneyland and Disney California Adventure (DCA) with our friends. Unfortunately for me, we got back to the hotel later than planned. So, I would be attempting my first half marathon with little sleep. However, once the alarm went off at just after 3am, I did my best to get ready and try to wake up. Like a lot of runners, the 13.1 mile distance was a little intimidating. Especially since I hadn’t exactly trained for this half marathon like I planned when I signed up. I was worried that I’d get swept and not be allowed to finish the race because I fell outside of the time limit of maintaining a 16 minute per mile pace. That translated to finishing the half marathon in 3 hours, 30 minutes. I was so worried that I wouldn’t finish in that time, that I had decided to just skip the race altogether. However, once my wife found out how much I had paid to be in the race, she convinced me to at least try. So, to appease my wife, I did just that. My strategy, given lack of training, was to finish the first 10K in 1 hour, 30 minutes. That would be a little slower than the slowest 10K I finished in 2012. I figured that, if I finished the first half (a half marathon is just over 20K) of the race in that time, I’d have two hours to finish the rest. All of that seemed like something I could accomplish (even without real training). So, as I waited for the bus from my hotel to Disneyland with many other runners, I had my Power Bar with Water and tried to keep warm. The shuttle arrived and we were off to the park. The downside to where this shuttle dropped us off at was that it was on the Harbor Blvd. side of Disneyland. There was a bit of a hike to get to the bag drop off point and starting corrals. 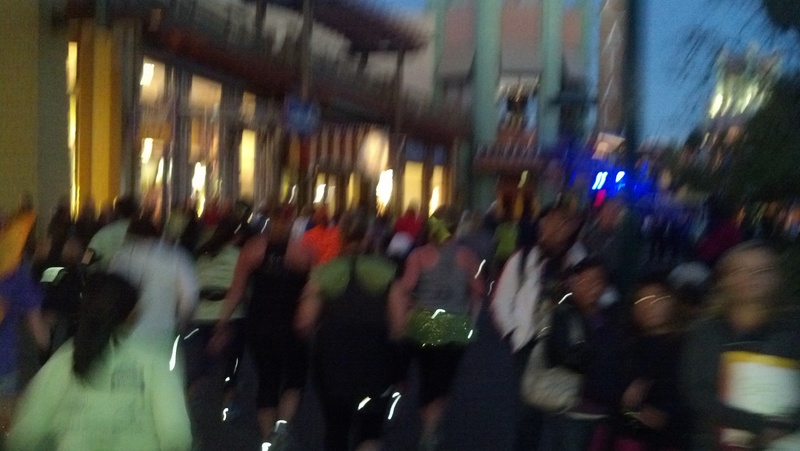 As we ventured off through Downtown Disney, I heard one runner wonder if we could count this walk as our first mile. One thing that surprised me on the walk was to see several food places open in Downtown Disney at the early hour. My corral was corral C, the first corral that men were allowed to be in. How I made it in this corral is something I don’t really understand. However, I was relieved to find that there would be two corrals behind us. While waiting to start, I struck up a conversation with two ladies who had done several half marathons (one of them even did the Goofy Challenge at WDW). They told me not to worry about being swept off the course. It really settled me down when these veterans told me they thought that we’d have around 4 hours 15 minutes to finish because the 16 minute per mile average starts when the last runner crosses the starting line. Cool! The ladies were nice enough to snap this “before” shot. Proof that I at least started the race. 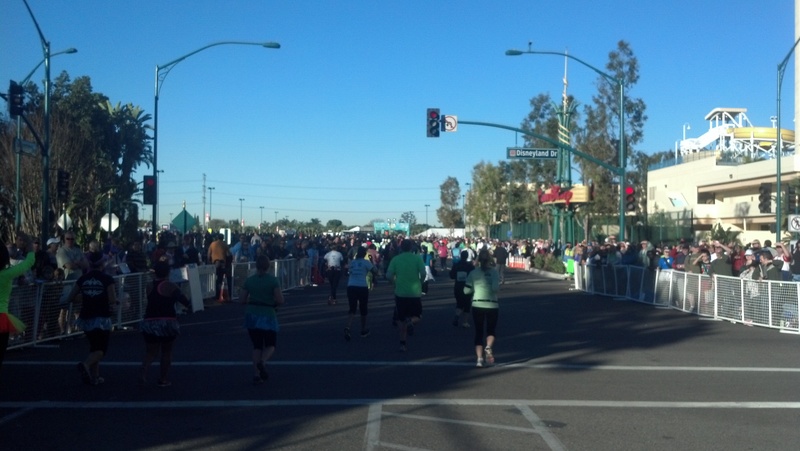 There were over 14,000 runners for the Tinker Bell Half Marathon. Look at all the people. Before I knew it, the MC’s were getting everyone ready for the start. Corral A was up and going with fireworks going off. About 5 minutes later, it was Corral B’s turn. With each corral, I moved closer to starting. Finally, it was our turn to start. I was off on a journey where I didn’t know the outcome. I kept telling myself before we started that the goal was to finish. I didn’t care about time. Sure, it would be great to finish in the 3 hour, 30 minute time constraint. However, I wanted to have as much fun as I could and finish. Mile 1 took us down Disneyland Drive, up Ball Road, and down Harbor Blvd, before taking us into California Adventure. One thing that I guess I shouldn’t have been shocked by, but was, is the clothing being tossed to the side of the road at the start. I couldn’t help but wonder what would happen to those clothes. Later I’d find out that Disney collects them and donates them to charity. As I was chatting with people beforehand, I was given the advice to not go out too fast. I took tha tadvice. I finished the first mile in 13 minutes, 4 seconds. I’ve run faster first miles before. So, I felt like this goal was achieved. 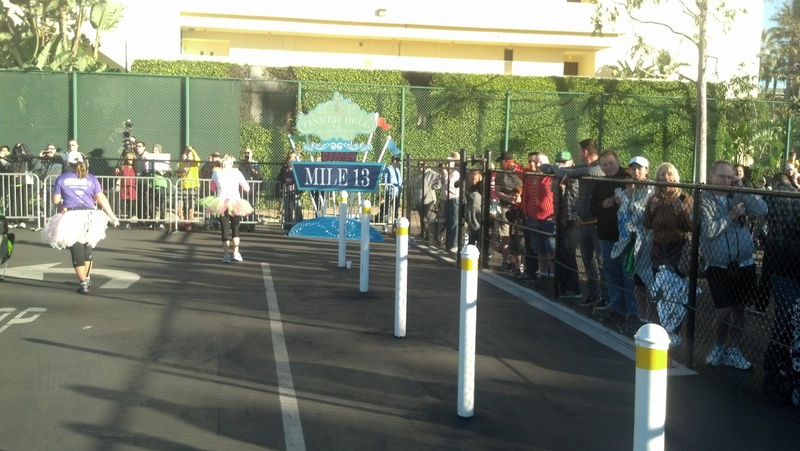 Mile 2 took us into California Adventure. 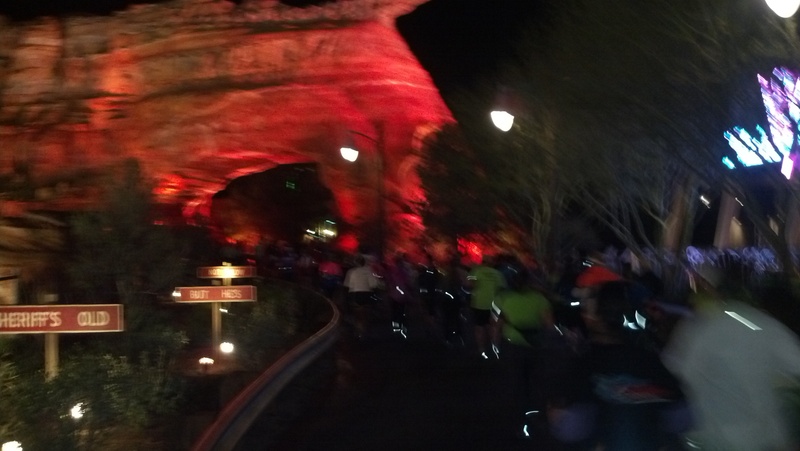 First we went backstage and came out around the Tower of Terror, much like the 5K race the day before. Unlike the day before, there was a marching band back stage to play for us and cheer us along. Pretty cool! 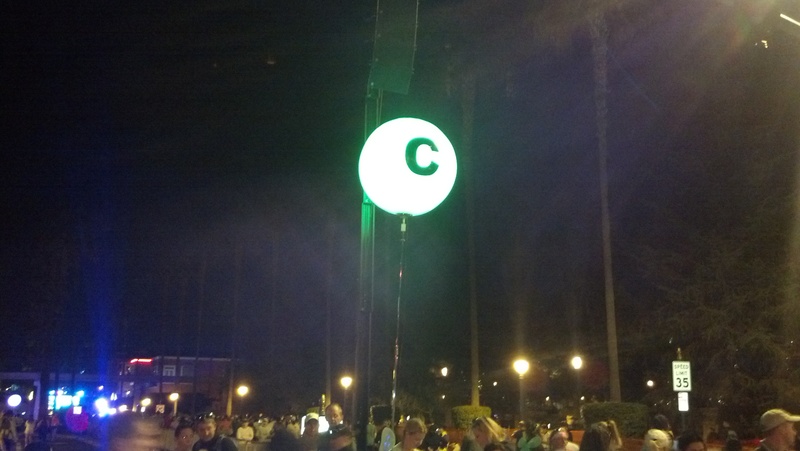 We came to the mile 2 marker on Hollywood Street and continued on past the Carthay Circle Restaurant on towards Cars Land. As you can tell, I was feeling good. From there, we made our way down through Cars Land and out by the Radiator Springs Racers (awesome ride!). From there, it was another quick turn backstage and we came out on the other end of the Paradise Pier. 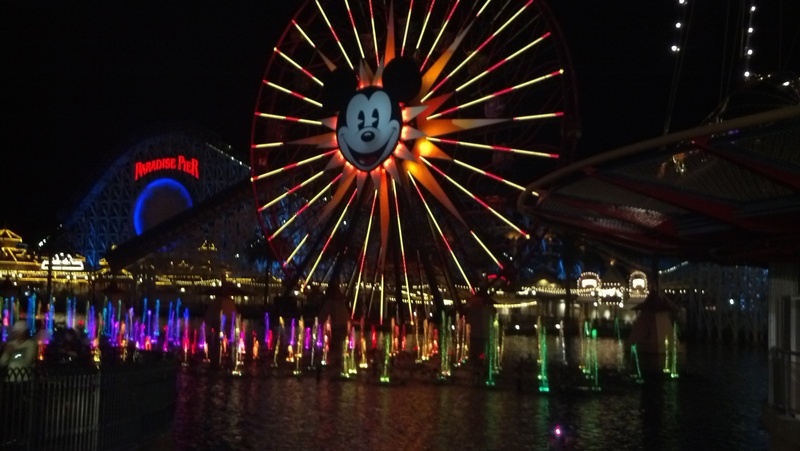 They had the water fountains going and the “World of Color” music playing. It was really cool! So, I took a couple of pics to remember the moment. 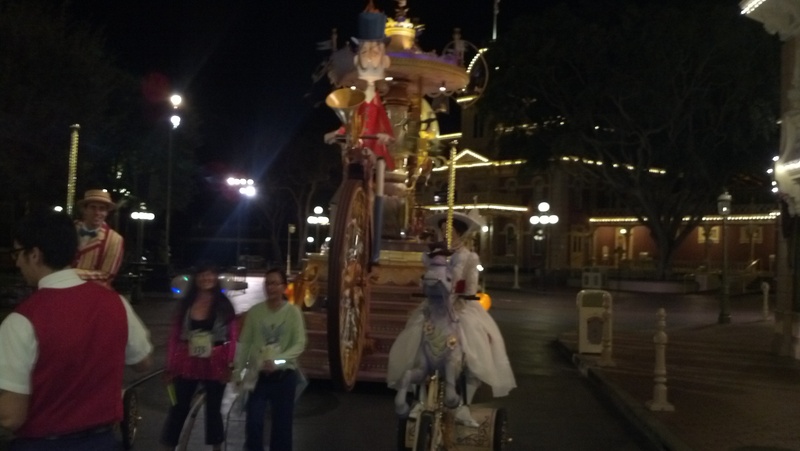 We made our way out of DCA and moved across the esplanade to the entrance of Disneyland. I was really encouraged by the volume of people in the esplanade there to cheer us on. As a matter of fact, there were more people for the half marathon than the day before. As I crossed into Disneyland, I decided that I’d walk through the entrance and then run down Main Street U.S.A. Once we got there, we saw Marry Poppins and crew. 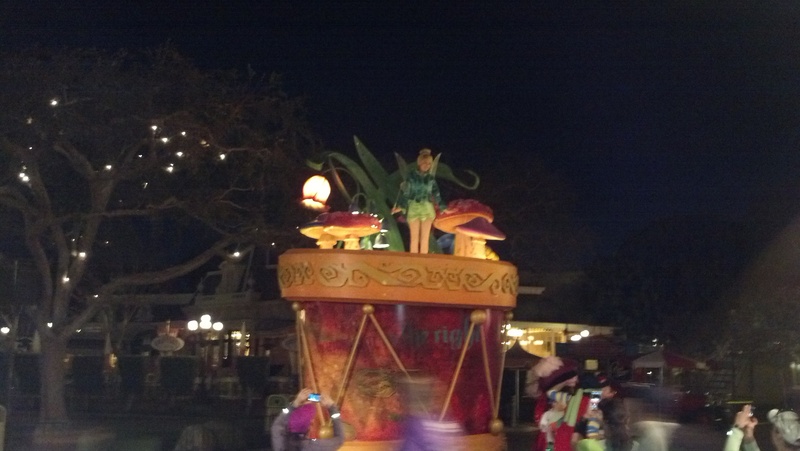 Further up Main Street U.S.A. was Tinker Bell herself. Of course, with this being her race, she had to make an appearance. Right? At the end of Main Street U.S.A., we turned right and ran through Tomorrowland. That’s where we ran into these guys. I was hoping that the force would be with me the rest of the way. Then, we wound our way by the Matterhorn and on the outskirts of Fantasyland. That lead us to “It’s a Small World” (still decked out for the holidays). 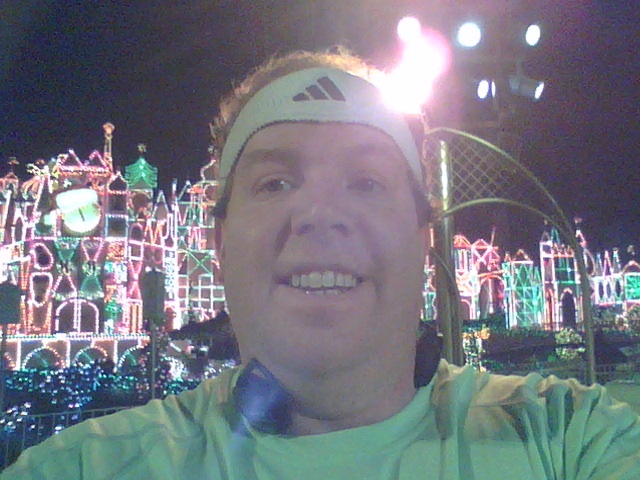 In my post on the 5K, I mentioned my love for Small World at the holidays. 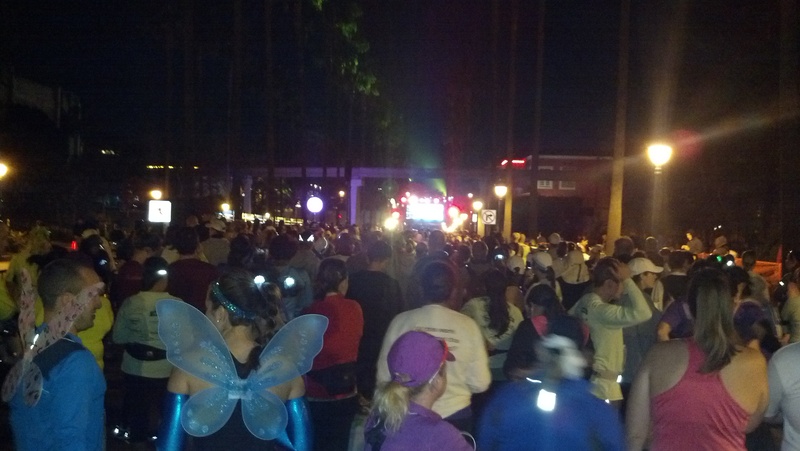 From there, we made our way backstage and it was pretty much the same route as we took to start the 5K. The only difference was running through the Castle. One thing you won’t see here are all of the mile markers I took pictures of while I ran. After taking pics of the first 3, I decided it would be a good idea to take pictures of all of them. You know, to prove that I passed all of them. This worked out great for me except for the mile 5 marker. It was here, backstage, that one lone Disney cast member said I couldn’t take a picture. I can’t blame him too much. After all, it is against Disney policy to allow people to take pictures backstage (even cast members). So, I totally got it. However, since no one else (in 2 days of running) had upheld this policy, it was strange that this one guy kept me from getting all 13 mile markers. Oh well, onward I went. After leaving Disneyland, we were off through Downtown Disney. Check out how large the crowds were here! 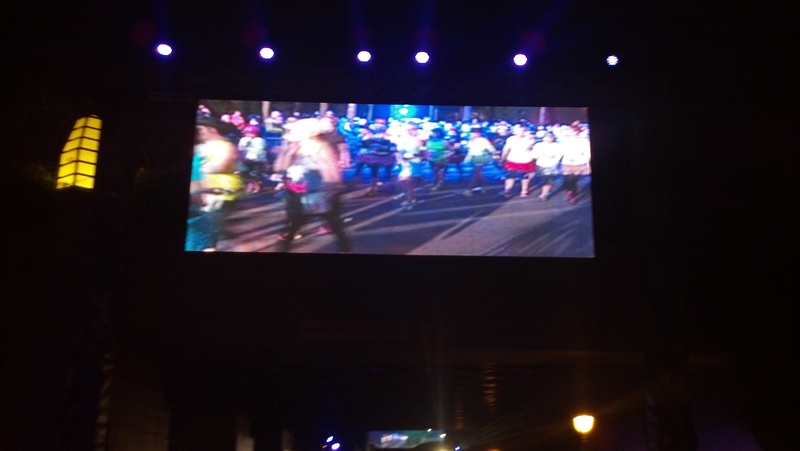 After leaving Downtown Disney, we approached the 6 mile marker and shortly after the 10K strip. I was coming up on my first goal…a 10K in 1 hour, 30 minutes. Mission accomplished! It was there that I finally felt all stress leave. I knew I had 2 hours to travel a little more than it took me to finish in 1 ½ hours. Once I crossed the 10K strip in my goal time, I decided it was time to ease up a little bit and try to conserve energy for the finish. However, not too far later, I came on the first of many on course entertainment. Going into this race, I didn’t know what to expect once we left Disney property. So, seeing this cheer leading group gave me another burst of energy and I ran some more. Each off property entertainment group (bands, cheer leaders, etc.) was so encouraging and gave me added energy. By the time I got to the mile 7 marker, I was surprised that I was not only finishing in under 15 minutes, but under 14 minutes. My time for the 7th mile was 13 minutes, 50 seconds. The eighth and ninth miles were pretty uneventful, except for the fact that my mile times were staying under the 15 minute mark. Of course, since I had never run more than 6.5 miles before this day, I was totally shocked. At the mile 9 marker was the moment I knew that I was going to finish the race. Not only that, but I was going to finish faster than 3 hours, 30 minutes. That was a powerful moment. I was almost in tears at this realization. As I thought about what I was doing, I started thinking about finishing in 3 hours, 15 minutes and that seemed very realistic. WOW! As if that wasn’t emotional enough, I knew that half way to the mile 10 marker, I would be passing the hotel my wife and I were staying at and she would be there to cheer me on. So, I just had to have energy enough to run by when I saw her. Here is the picture she got of me as I passed by. At the 10 mile marker, I developed the strategy that would bring me home. I’d walk 5 minutes. Then, I’d run 30 seconds, walk a minute and a half until the next mile marker. Also, I was encouraged to realize that I was now a 5K away from finishing my first half marathon. The crazy part for me was that I wasn’t struggling as much as I thought I would. As if that weren’t cool enough, I was also realizing that I would finish in less than 3 hours, 15 minutes! The 12th mile was the longest mile for me. It’s the only one I completed in 16 minutes and was the most boring mile on the course. We had very little entertainment to keep us distracted and, knowing we were getting so close to the finish, made the 12th mile difficult. Seeing the Disneyland Resort again did perk me up. Going under that tunnel to get us back stage at DCA wasn’t fun. However, once I saw the 12 mile marker, it didn’t matter. 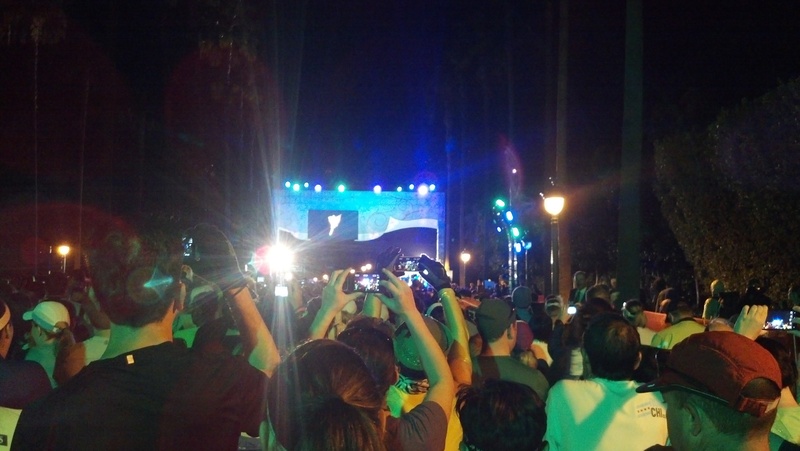 This time, we stayed backstage at DCA. Along another stretch I saw one of the professional photographers. So, I had to keep the energy up and run while he was there. Upon exiting DCA, I could finally see the finish line! The sad part to the finish is that it wasn’t a straight shot to the finish once we saw the actual finish line. There was a couple of more turns before we hit the home stretch. Now it was time to finish! Crossing that finish line was one of the sweetest moments in my life! This is what joy looks like. After finishing, I was very emotional. I’ll admit that I had to wipe away a few tears. With all that goes on after the finish, it seemed a little chaotic. I tried to take it all in before getting my finishers medal because this was a big accomplishment. 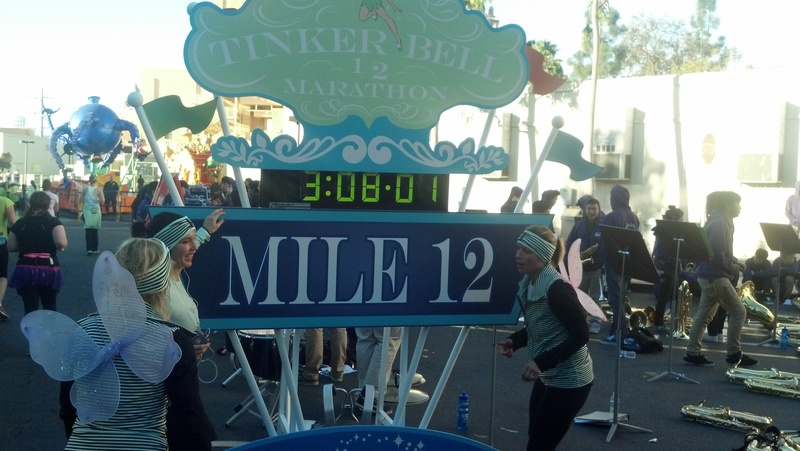 My finishing time was 3 hours, 11 minutes, 22 seconds…almost 20 minutes under my pre-race goal! Compared with serious runners, I know that this time was slow. However, I’m just starting on this journey…AND…I didn’t really train for this race. So, I’ll take whatever time I got and be proud of what I did. 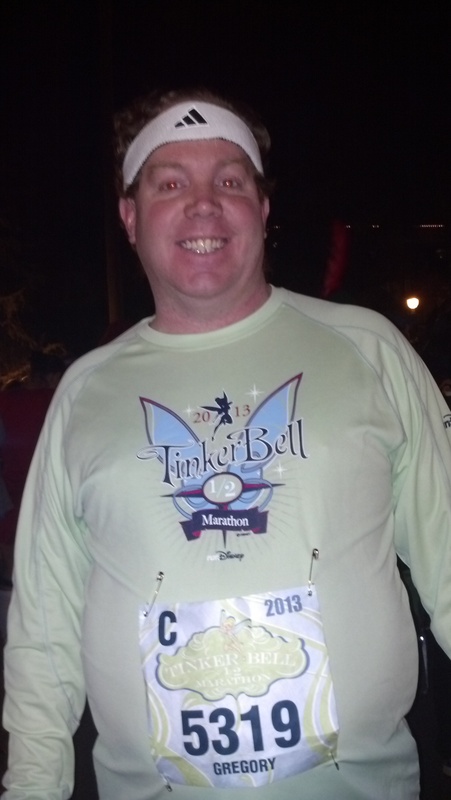 Here I am with a Tinker Bell medal. I know it’s not the most manly of medals. However, to me, it represents 13.1 miles and finishing my first half marathon. After finishing my first half marathon, I’m hooked. Bring on the next one! LOVE this recap! Well done!!! I really enjoyed your recap. You did an awesome job! 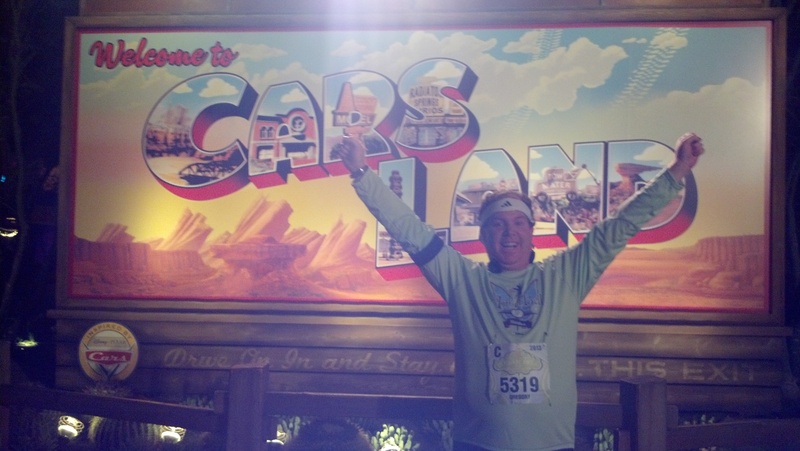 Looking forward to seeing you at other runDisney races. Glad you enjoyed the recap. 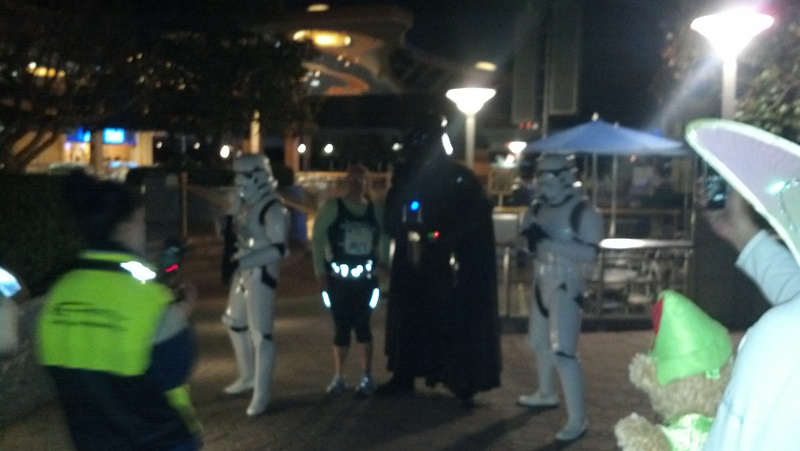 I love runDisney races. 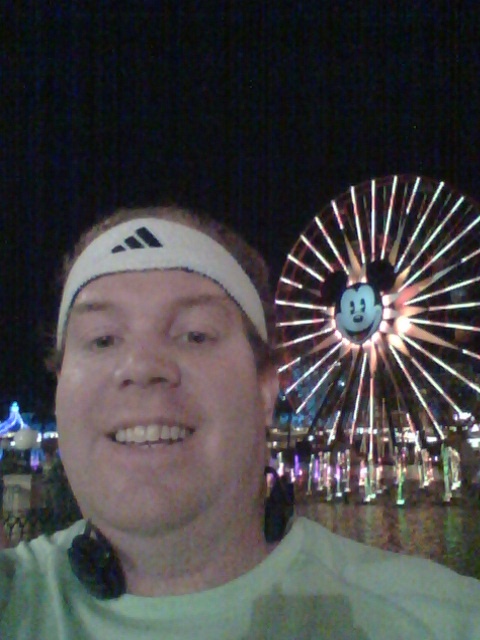 Can’t wait for Disneyland Half Marathon and 10K! 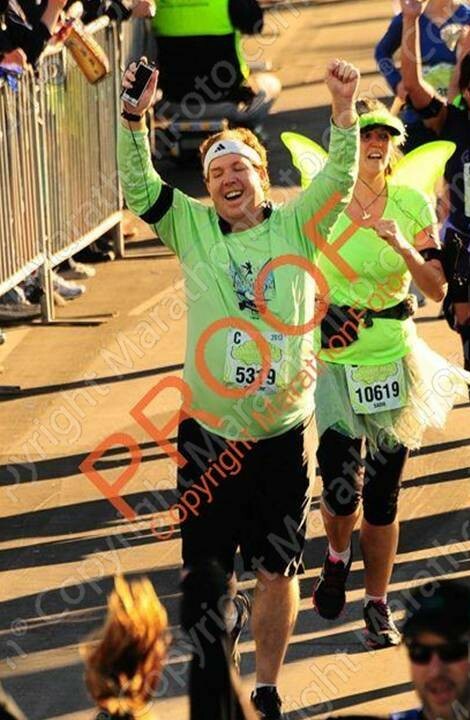 I think your finish line photo may be the BEST finish line photo I have ever seen. Great recap!!! Coming back for Tink ’14?? I know. Right? I love this picture as well. It completely captures what I was feeling at that moment. Thanks for the comment! As for Tink 2014, I’m not sure. 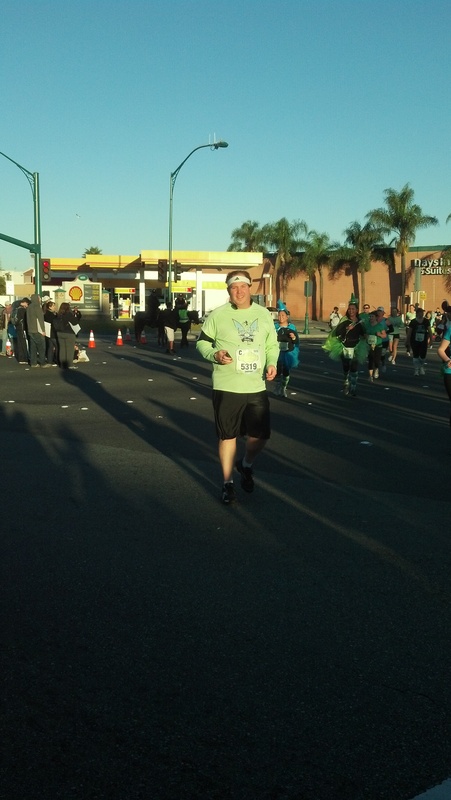 Right now, I’m trying to see if I can afford a trip to Disney World for the 2014 WDW Marathon. 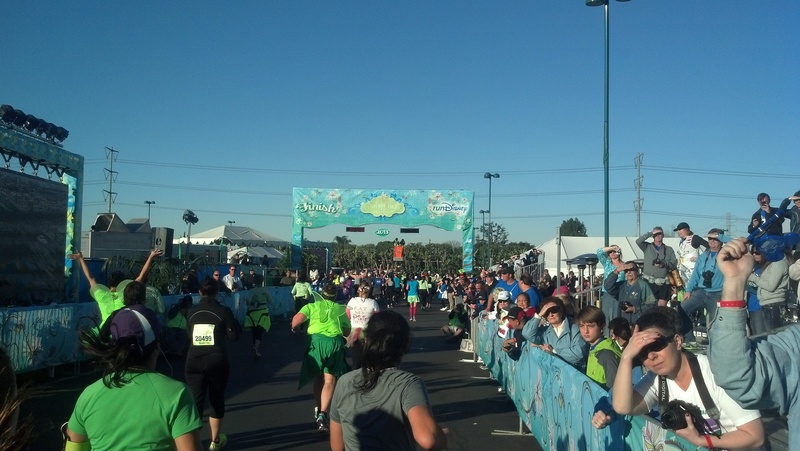 I’ve never done a marathon before and thought that a runDisney marathon would be legendary. 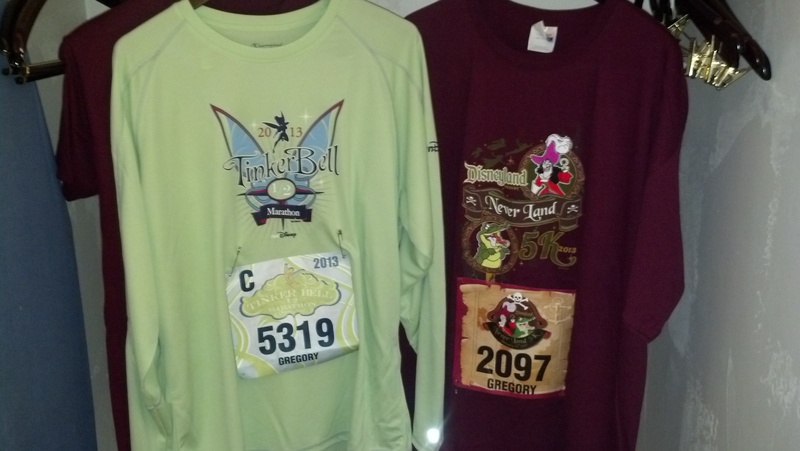 I’m also thinking of doing the first 10K at WDW that same weekend with my wife. Friends of mine have mentioned doing the Neverland 5K. So, I probably would do that with them. You never know. I might just be inspired to go for the Coast to Coast medal and do Tink. It was a fun race!